Marketing solar: Bring in Elizabeth Warren? Last month, my husband opened the door to a solicitor from a solar company and eventually agreed to let the polite young gentleman on our porch order a quote for our family to go solar. The three-page form that the company sent had several very misleading figures. I was appalled. Let me be clear – I am no foe of solar. At some fundamental level, I can see the appeal. If we really want to reduce carbon emissions dramatically and address global warming, solar power of some form likely has to be part of the global solution. But, I do not think companies should be allowed to misrepresent information. (I am not revealing the company’s name because I don’t want to out any one person or company. I will say that this is no fly-by-night outfit.) From the first two numbers under “YOUR FINANCIAL BENEFITS,” it looks like we will spend approximately $12,400 and save $39,500. And, if you look more closely at the savings, they are net of the upfront cost. How could we not sign up right away? Seems like we would be ripping up a check for $39,500, right? Go to the second page, and you see how the company calculated the $39,500. They’re adding up savings over the next twenty five years without discounting savings in the future. This company would fail my colleagues’ introductory finance course. We would pay the costs of $12,400 in today’s dollars, in order to save $3,576 in the year 2038, assuming we’re lucky enough to be alive and buying $100 cheese pizza for our grandchildren. There’s another part of the quote that’s potentially misleading. The savings the company projects reflect their estimates about our electricity bills in the future. 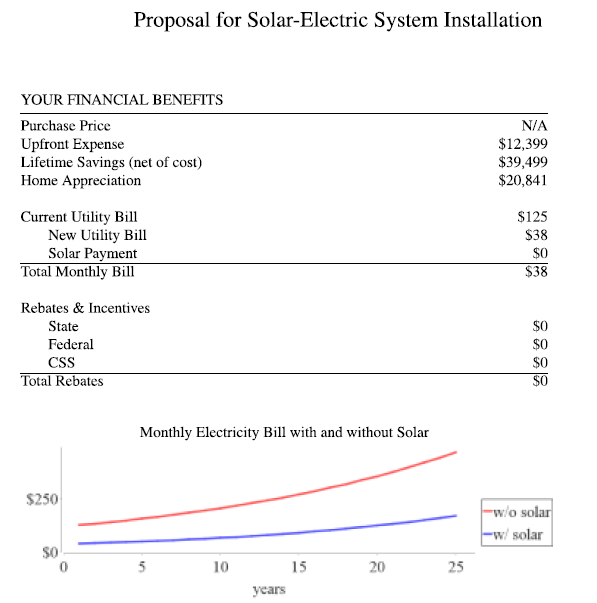 The first two columns on the second page of our quote titled “Utility Without Solar” and “Utility With Solar” are their guesses about what our electricity bills will be with and without solar. The difference between these columns yields their “Annual Savings” estimate. The columns embed assumptions about how our usage and electricity prices will change over the next 25 years. The company estimates that our utility bills without solar will go up by more than 5 percent a year. The escalation in electricity payments is also reflected in the upwards slope of the red and blue lines on the first page of our quote. It’s not clear from our quote which part of this is the growth in electricity prices and which part is the growth in our usage, but apparently other solar companies break out the components. 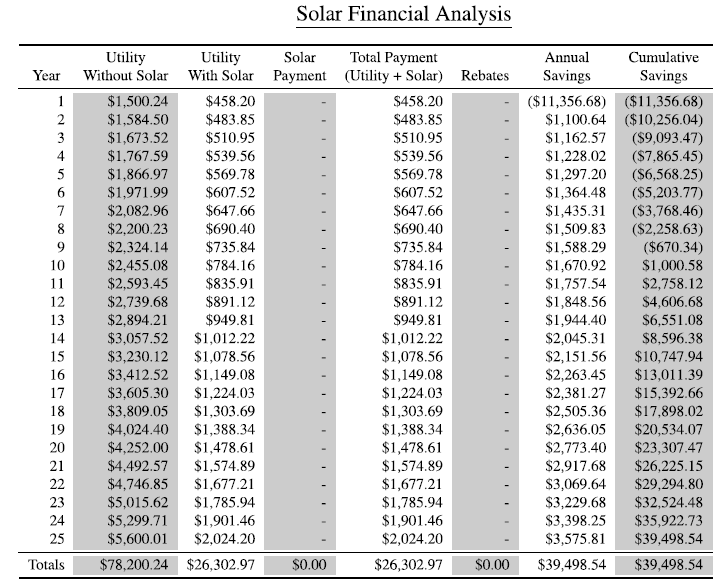 Greentech Media reports that a gentleman in California has sued Sunrun, the company that convinced him to lease a solar system, for deceptive marketing. The company’s promotional material suggested that utility prices would go up by 5 to 6 percent, while his have leveled off since he bought his system in 2011. There are at least two more components of the quote that are misleading, but this post is already long, so I will continue with another installment. Certainly, some people want to go solar for reasons other than saving money on their utility bills, and for them, the numbers aren’t important. But, for the rest of us, who want reliable guidance on how much money we will save with a large financial decision, companies like the one on our porch are doing a disservice. It’s time to impose better oversight on the way these companies present information.